78 total U10 – U14 racers (ages 13 and under) competed in the second race of the Central Series this past weekend at Dodge Ridge. 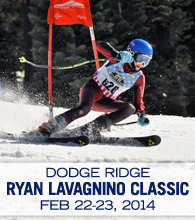 February 24, 2014 — PINECREST, Calif. – The Dodge Ridge Race Team dominated the Ryan Lavagnino Classic Giant Slalom Race this past weekend under bluebird skies on Bobby’s Freedom Run at Dodge Ridge. Over 75 young athletes from Dodge Ridge, China Peak, Bear Valley and Yosemite Winter Club competed under excellent conditions in the second of four regular season races in the USSA Far West Central Series. The win this weekend all but solidified the Dodge Ridge Race Team’s shot at a 4th straight Central Series Silver Cup title. Highlights of the weekend included 1st place sweeps Saturday and Sunday by four Dodge Ridge Race Team (DRRT) members in their respective divisions. For the girls, Alexis Ghiglieri won both U10 class races and Ava Law successfully won the U14 races and the boy’s side was dominated by the victories of U10 racer Iain Ferguson and his teammate Stash Perry in the U12 class. Other podium results for the DRRT ladies included Meara McCarthy racing to a 3rd place on Saturday and improving to 2nd on Sunday in the U10 races, and U12 racer Jensen Perry securing 3rd place both days just seconds behind Emerson Action who picked up 1st on both days in the girls U12. In the U12 men’s class Ethan Perry earned a 3rd on Saturday and Evan Lear did the same on Sunday while U14 racer Blake Action took the top spot on Saturday with Jake Kalia of Dodge Ridge following closely in 2nd and Tej Suklikar consistently finished in 2nd place on both days in the U10 class. Special awards for fastest overall Central Series U10, U12 and U14 men’s and women’s combined times were handed out on Sunday. U10 class combined time victories were awarded to Dodge Ridge racers Alexis Ghiglieri (3 minutes, 21.71 seconds) and Ian Ferguson (3:23.73). U12 combined time wins went to Emerson Action (2:56.67) and Dodge Ridge’s Stash Perry (2:52.93) and the U14 class was won by Ava Law (2:58.05) of Dodge Ridge and Blake Action (2:58.98). The Next USSA Far West Central Series race will be held at China Peak, March 1 & 2, followed by the final regular season race at Badger Pass on March 22 & 23, where the Dodge Ridge Race Team athletes will have the chance to secure the overall series team Championship and keep the Silver Cup at home for a fourth consecutive year.